We've got about 60 deals for you today, including discounted laptops and games, a bunch of mid-sized HDTVs (for those of you who complained), cheap movies, a free boobie rub, and a list of where you can catch some awesome deals for the Memorial Day weekend. • Dell Vostro 1520 15.4" Core 2 Duo Laptop with 3GB RAM for $549 (normally $821). • Dell Inspiron 15 15.6" Laptop w/ 2.0GHz Dual Core for $479 (normally $723). • ASUS Eee PC 9" Netbook with 1GB RAM, XP Home (refurbished) for $199.99 plus free shipping (normally $320). • Asus Eee PC 9" Netbook with 1GB RAM, Ubuntu Linux (refurbished) for $164.99 (normally $189). • Apple Mac Mini Miniature Desktops (1st Generation) with 1-year warranty (refurbished) starting from $419 (normally $499). • Dell E2209W 22" LCD Monitor for $152.10 plus free shipping (normally $209 - use coupon code VBGH?K188CBWMC). • Xbox 360 Elite System with Halo 3 and Fable II Bundle for $339.99 (normally $400). • PlayStation 2 Slim Console (Silver) Plus 3 FREE Games $99 (normally $127). • Armored Cored: For Answer on PS3 for $32.99 plus free shipping (normally $39.99). • Gangs of London on PSP for $13.40 (normally $29.99). • Halo 3 on Xbox 360 for $39.99 plus free shipping (normally $59.99 - valid today only). • Final Fantasy XI: Wings of the Goddess on Xbox 360 for $9.99 plus free shipping (normally $19.99). • Teenage Mutant Ninja Turtles on Xbox 360 for $15.99 plus free shipping (normally $29.99). • Universe at War: Earth Assault on Xbox 360 for $13.99 plus free shipping (normally $19.99). • Kane and Lynch: Dead Men on Xbox 360 for $14.99 plus free shipping (normally $29.99). • Warhammer: Battle March on Xbox 360 for $14.99 plus free shipping (normally $29.99). • GunPey on DS for $8.79 (normally $19.99). • Monster Jam on Wii for $21.09 (normally $49.99). • Maelstrom on PC for $1.90 (normally $9.99). • Fantastic 4 on PC for $7.90 (normally $19.99). • Everquest: The Planes of Power on PC for $3.90 (normally $8.99). • 46'' Sharp Aquos LC46SE94U 1080p 120Hz LCD HDTV for $1,188.00 plus free shipping (normally $1,326 - use coupon code AFLSHP1188). • 42'' Vizio XVT SV420 1080p 120Hz LCD HDTV for $764.15 plus free shipping (normally $1,028 - use coupon code 65G7RQ11J?M2LH ). • 42'' Philips 42PFL5704D/F7 1080p 120Hz LCD HDTV for $899 plus free shipping (normally $1,033). • 42'' RCA L42FHD37 LCD HDTV for $698 (normally $999.99). • 32'' Sceptre 1080p LCD HDTV for $449.99 plus free shipping and wall mount (normally $605). • 32'' Samsung LN32B460 720p LCD HDTV for $552.49 plus free shipping (normally $649.99). • Sharp BD-HP20U Blu-ray Player (refurbished) for $139.99 (normally $199). 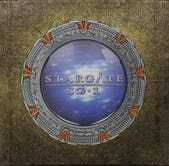 • Stargate SG-1: The Complete Series Collection on DVD for $189.99 plus free shipping (normally $329.99). • Two and a Half Men: The Complete Seasons 1-5 on DVD for $99.99 plus free shipping (normally $114.99 - valid today only). • Seinfeld: The Complete Series on DVD for $139.49 plus free shipping (normally $250.95). • Superhero Movie: Extended Edition on Blu-ray for $11.99 (normally $29.95). • 100 HD DVD Movies for $374.97 (exclusive). • TomTom One XL 4.3" GPS (refurbished) for $89.99 plus free shipping (normally $129.99). • Pharos Drive 200 GPS for $58 plus free shipping (normally $75 - use coupon code VBGH?K188CBWMC). • Unlocked Nokia N79 Smartphone for $211 plus free shipping (normally $300 - use coupon code VBGH?K188CBWMC and this rebate form. Valid through 5/28). • Unlocked HTC Touch Diamond Smartphone with TouchFLO 3D GUI for $370 plus free shipping (normally $499). • Aliph Jawbone Bluetooth Headset for $39.99 plus free shipping (normally $59.99). • Klipsch Custom-1 Earphones for $49.99 (normally $70.24). • iPod/iPhone Charging Cable for $.91 plus free shipping (normally $19). 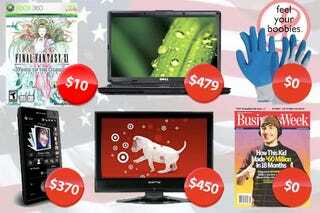 • Big Lots Huge Memorial Day Sale (includes camcorders, phones, mp3 players, vacuums, video games and more). • Office Depot Memorial Day Sales (includes 1TB Seagate FreeAgent External HDD for $99.99, 23'' Samsung 1080p LCD HDTV for $279.99 and more. • Eastern Mountain Sports has up to 30% off Select Items. • 15% off at NFLShop.com (no minimum purchase amount necessary). • Home Depot has 10% off for Military Personnel. • Pottery Barn Memorial Day Sales has up to 50% off on select items (includes an outdoor thermometer for $59). • Fanny May Candies has 30$ off in-store purchases. • DisneyShopping sale includes up to 60% off plus coupons. • Amazon's Kitchen and Home Memorial Day Sale has up to 60% off on select items. • Microfiber Automotive Cloth and Super Grip Latex Coated Gloves for $0. • Down Home Healthy Cooking: Recipes and Tips for Healthy Cooking for $0. • 1-year Subscription to Business Week Magazine for $0. • 1-year Subscription to Horse Illustrated Magazine for $0. • 1-year Subscription to Town & Country Magazine for $0. • Feel Your Boobies Car Magnet for $0. • Mercedes Benz MP3 Music Download for $0. • Alive Records 2009 Samples by Various Artists MP3 Album Download for $0. • "Pins and Needles" by Project Jenny, Project Jan, Fujiya and Miyagi MP3 Download for $0.